For our first example, we demonstrate how to add a simple sound file to a newly-created project and play it. We start by adding the sound file to the project. Then select the sound file that we want to play, something like an .mp3 or .wav file, and left-click the “Open” button. Then right-click the file under the “Library” tab to open the context menu and left-click “Properties…” in the context menu. This opens the “Sound Properties” dialog. Finally, left-click the “OK” button to create the class. 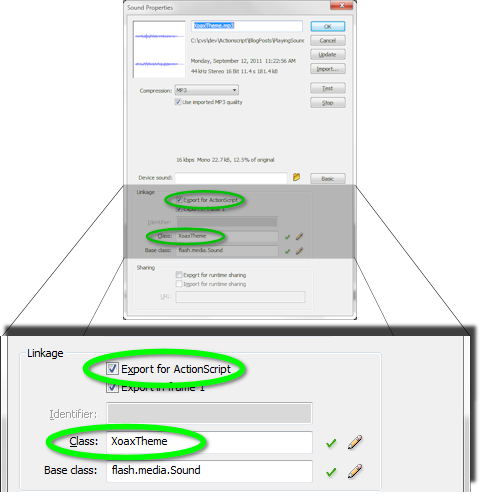 Now, “Export: XoaxTheme” is under “Linkage” in the “Library” tab next to the file name “XoaxTheme.mp3”. This plays the sound file that we added and finishes our first example. This simple example only uses two lines of code. In our next example, we demonstrate how to loop this music with the code in a separate class file. This entry was posted on Friday, September 16th, 2011 at 12:20 am and is filed under Actionscript. You can follow any responses to this entry through the RSS 2.0 feed. You can leave a response, or trackback from your own site.